There was an elegant reception last night for the long-awaited (at least by me) exhibit sponsored by the Shaker Museum and Library at the Darrow School Joline Arts Center, located at the Mount Lebanon Shaker Village in New Lebanon, NY. Jeff Rosenheim, Photography Curator at the Metropolitan Museum of Art supervised the installation and it is beautiful. One room contains a selection of archival photographs, both of the Shakers in the 1800’s and of the buildings taken as part of a PA project in the 1930’s. The ground floor contains the photographs submitted by invited artists, and the second those contributed by students and amateur photographers. I was thrilled to see my image hung in the center room in a prominent location. This window I photographed is part of a large wooden carriage house with peeling red paint. The sky was bright blue late one afternoon in early May and the leaves on the trees were the light green of early spring. 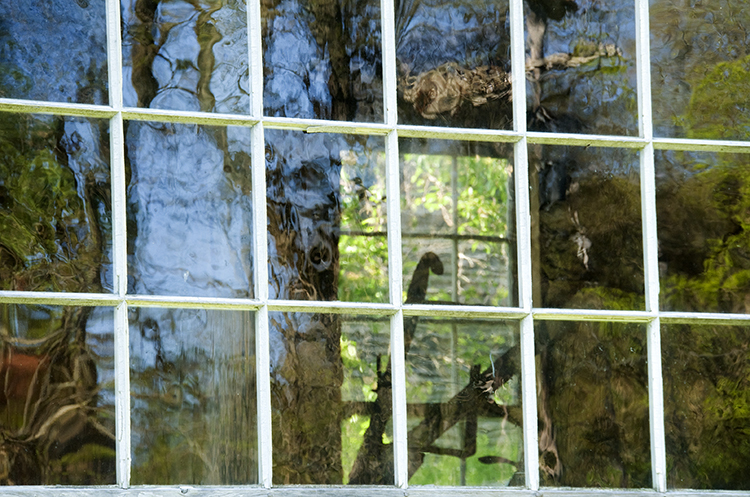 I loved the way the landscape was reflected in the old glass. You can see an old plow inside the building and another structure in need of restoration through the far window. Mimi Forer designed an unusual catalog for the images by the invited artists and some of the archival images. Each image is on a separate detached page that can be framed. The pages, descriptions and end page grid of all the works are contained in a transparent container. The exhibit will be open through July 3. On July 10th there will be a silent auction to benefit the restoration of the Shaker Village at the Museum’s Sixtieth Anniversary Party. This photo is great! Wish I could render it in a beadweaving. I Love Big Bambu Beauty on a damp, drizzly day….